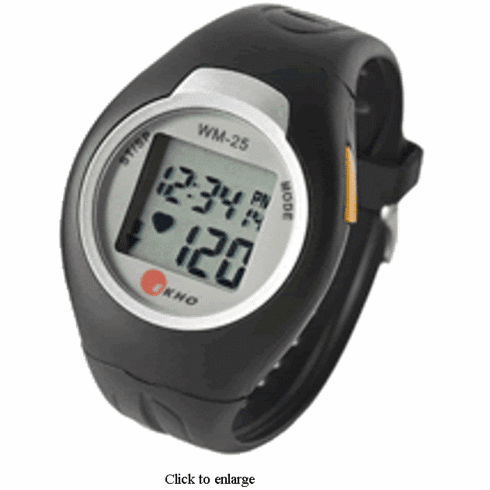 The WM in the WM-25 stands for weight management, telling you all you need to know about the Ekho WM-25 heart rate monitor watch. Unique to Ekho heart rate monitors, the unit's weight management feature lets you enter how many calories you want to burn during the day. Then, as you work, walk, exercise, and play, the watch tells you how many calories you've scorched on your way to your goal. It's a terrific way to keep fit, and it makes sure that you don't overlook your daily activities as important allies in your weight loss plans. Plus, it's designed to interface with the heart-rate-interactive equipment in most health clubs, adding even more versatility to the mix. In addition to its weight loss functions, the WM-25 tracks your current, average, and maximum heart rate, while also offering a target alarm that lets you know whether you're working in, above, or below your target heart rate zone. As a result, you'll maximize your caloric burn and enjoy the most effective cardiovascular workout available. Other features include time and date functions, a stopwatch, an audible "alarm off" mode, and an ultra-slim ergonomic chest belt transmitter. The water-resistant WM-25 carries a five-year warranty.